GEM Shells are without any perceptible blemishes or bugs. The specimen is fully adult and in average size. (Fine+++) Shells have a very small flaw or blemish that is hard to find. Visually no deductions to GEM. F++ (FINE++) Shells have small perceptible flaws or a small blemish that does not harm the appearance of the specimen. F + (FINE+) Shells have noticeable flaws, growth lines or blemishes that are normal according to the species. These specimens are still excellent for a collection and are generally considerably cheaper than GEM specimens. F (FINE) Shells with a (small) break, a growth line, scars, a malformation, or other flaw. Also very fresh specimens that are found dead (fresh dead) are often classified as FINE. GOOD Shells with breaks, growth lines, scars, blemishes or other flaws. Some species are found only in this condition. FRESH DEAD Found dead in the water or on the beach. Very fresh copy without the usual BEACH features. A description of the condition is usually added (from good to fine). BEACH Empty shell found on the beach, abrasion, and bleaching of the specimen. The specimens we offer have no great damage. Specimens in good quality are owing to smaller prices often more popular. With mollusks (dried or in alcohol), desirable for study purposes for some species. Only stocked in individual cases. Malformation or malformations on the shell. The malformation is NOT damage; malformed shell, often flattened or constricted at the ends ("beaked"). SINISTRAL Left-spiraling ("left handed") shell. 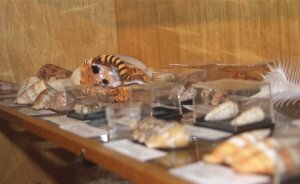 There are species whose shells are naturally left wound, but also left-spiraling specimens of species that are normally right-spiraling ("right handed", dextral). ALBINO White shell of a normally different-colored species. Not a bleached specimen. tiny Tiny (adult) specimen under 5 mm. These are usually correspondingly small species.